In the future, cars, drones and other robots may not need human pilots – but they will need creative and knowledgeable engineers. Two new programs at the University of Toronto's Faculty of Applied Science & Engineering will prepare a new generation of experts to lead the development of artificial intelligence, machine learning and big data. U of T's engineering science major in machine intelligence is the first undergraduate engineering program in Canada to specialize in the study, development and application of algorithms that help systems learn from data. Such systems are already widespread – they power voice-activated assistants such as Siri and Alexa, for example – and are expanding into sectors such as manufacturing, health care and finance. More than 40 students have enrolled in the program, which launches in September. Researchers and students in the Faculty of Applied Science & Engineering have created a robotic retrofit for self-driving wheelchairs and autonomous drones that could one day perform environmental monitoring or deliver automated external defibrillators (AEDs). They have launched spinoff companies such as Deep Genomics, which uses AI to seek out the genetic roots of complex medical conditions, and ModiFace, whose facial recognition and augmented reality algorithms were recently acquired by L’Oréal. U of T is also home to the Vector Institute for Artificial Intelligence, whose chief scientific adviser is computer science University Professor Emeritus Geoffrey Hinton, regarded as the "godfather" of the artificial intelligence technique known as deep learning. Both Vector and the Faculty of Applied Science & Engineering’s Institute for Robotics and Mechatronics bring together top minds in a diverse set of areas both inside and outside engineering, including neural networks, socially assistive robotics, computer vision and natural language processing. 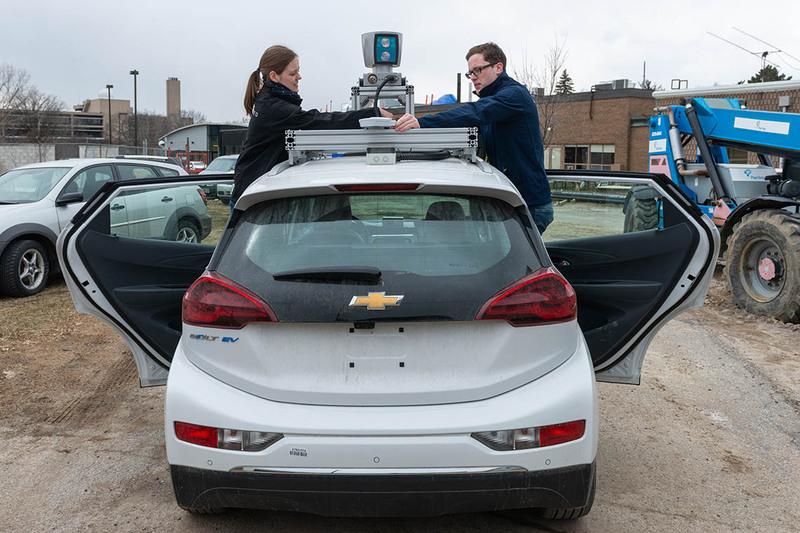 Adragna is deputy director of marketing and outreach for aUToronto, U of T’s entry into an international competition that challenges students to turn an electric vehicle into a self-driving one. In April, the team’s vehicle, dubbed Zeus, took the top spot in the first of the competition’s three annual meets. A second academic program, the Master of Engineering in Analytics, launched in January and is open to professional-stream graduate students. Students in this program learn techniques and strategies to translate large data sets into useful insights. This could lead to smarter cities, more efficient delivery of health care and improved logistics for advanced manufacturing. The Myhal Centre for Engineering Innovation & Entrepreneurship, which officially opened earlier this year, will further catalyze innovation in artificial intelligence and machine learning. It provides a new home for the Institute for Robotics and Mechatronics, as well as prototyping facilities and dedicated space to facilitate between students, faculty, alumni, industry partners and business mentors. The division of engineering science is also hosting an event for alumni called Return & Learn: Alumni Machine Intelligence (MI) Bootcamp on Saturday, Sept. 22. The sessions feature programming tutorials and keynotes designed to help alumni get up to speed with the latest developments in the field.